When it comes to classic, vintage icons of horror cinema, you may think of King Kong, Dracula, the Wolfman. 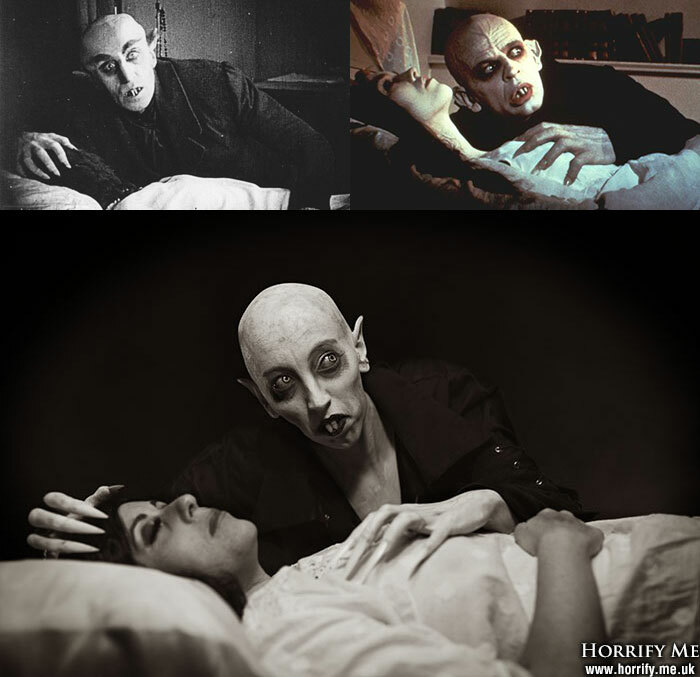 But you can stretch back through time even further, all the way to 1922, to one of the earliest horror films: Nosferatu. 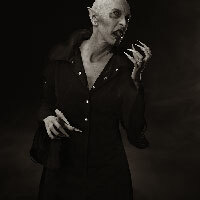 After the Prana Film studio was unable to obtain the rights to Bram Stoker's Dracula novel, they decided to re-configure the story which stuck pretty close to the original story but replaced Dracula with the hideous, bald figure of Count Orlok, famously played by Max Schreck. The vintage film had a beautiful, poetic remake in 1979, directed by Werner Herzog and starring a very theatrical Klaus Kinski as the vampire (with his vampire name restored to Dracula). I love both of these versions of the film and the interesting artistry they bring to the genre of horror. 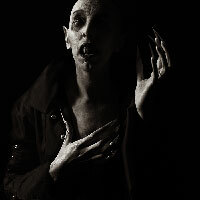 For my own version of "Nosferatu the Vampyre" I wanted to capture a particular elegance of character and a morbid personality. I came to the conclusion that using a female model would be better for this, as I (rightly or wrongly) convinced myself that feminine elegance would create a more haunting creature. Please don't ask me why - my mind probably works in weird ways. I also wanted a real bald lady, rather than use a rubber bald cap. I am not a fan of bald caps. Although I do use them, I always prefer a real bald head if possible. You just cannot beat the real thing! Even the very best bald caps don't always fool your eye, whereas real baldness - especially on a young female - can be very striking. Had this been any other shoot I would have settled for a bald cap but on this particular shoot, it had to be the real deal. If I couldn't find a bald lady then I wouldn't have done the shoot, as I didn't feel the authenticity would have been present in the photos. As you might imagine, casting for this was difficult. The world is not exactly heaving with women who are willing to hack off their gorgeous locks to become a bald vampire for some strange guy in a desolate Kent barn! 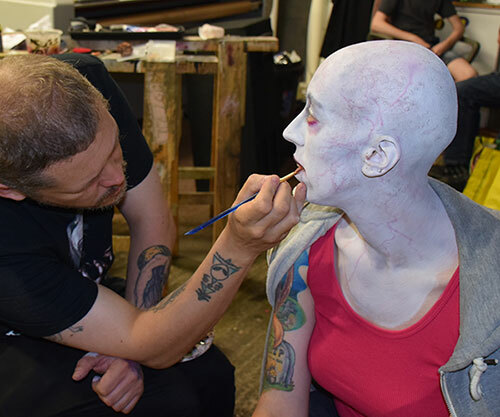 But it wasn't just bald that mattered: I needed to cast a very particular type of lady too - very tall, very slim, with big expressive eyes, and long, slender hands to perform elegant vampiric body language. I felt like I would have to compromise to some degree in order to get the shoot done. I mean, nobody was exactly going to match every quality on my list, were they? Was I asking too much? I could hardly believe my luck when I found someone who didn't just tick all the boxes, but exceeded the requirements I had. She was tall, slim, had those exact elegant hands I wanted, and a willingness to give her dyed and slightly damaged hair a proper "reboot". The truly awesome Sara Cridland was absolutely perfect for this role. Not only was she willing to shave it all off, but she arranged a charity event around the hair removal and raised close to £1000 for a cancer charity! I told you she was awesome! And so, on with the shoot. I painted and airbrushed Sara in very pale tones, fitted her with the long Gothic coat, and glued her fangs in. The smoke machine was warmed up, the lights were dimmed, and off we went. Directing Sara into a variety of poses and exploring all manner of artistic lighting was a wonderful experience. 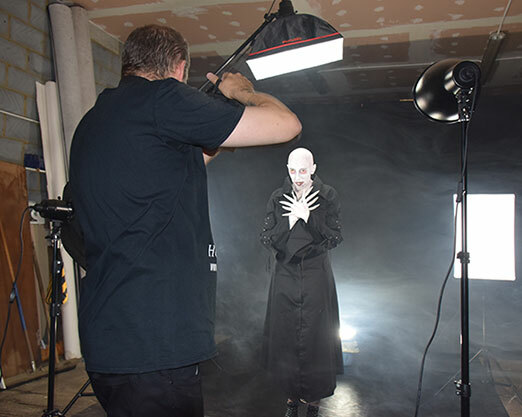 Despite all the odds that were stacked against me ever doing this, there she was standing right on front of me - my very own stunning, perfect and deliciously creepy Nosferatu. My wife Claire willingly surrendered herself to becoming the vampire's sleeping victim which allowed me to recreate one of the film's most chilling and iconic moments. Editing the photos proved to be an interesting task. Although they were shot in colour, I decided to edit them in sepia tone. The sepia images were made quite contrasty, and very slightly degraded using overlaid high contrast layers, to give them an old cinematic look, although the effects were kept very subtle. They are, after all, modern digital images, and I was not trying to fool anyone into thinking they were 100 year old celluloid negatives, but by making them just very slight less clean they do have a degree more authenticity. I'm so thrilled that I got to do this shoot exactly the way I wanted.